How much fun is it when the lyrics of the song help do your cueing for you? Oh yeah, this one is gonna make your legs hurt…in a good way! It’s short enough that everyone can make it through, but they’ll remember this one for a long time. In fact, I bet your riders will ask for this song (and this drill) by name! It’s a high-intensity effort with high-cadence surges during three segments of the song (as outlined below). The bpm is 105, so you can do the short surges one of two ways. I recommend practicing both methods on your own to see which works best for you and your riders. One option is to have them ride the whole song at 105 rpm and then increase resistance during the short surges. Be careful; that cadence may be unattainable for some riders. Also, make sure they don’t reduce resistance too much after the surges—the goal is to keep the challenge going through to the end. Another option, and the one I prefer, is to begin at a cadence around 90 rpm and instruct them to find a resistance that feels “somewhat hard.” If you have power, this should be high Zone 3/low Zone 4 power, just below FTP. Then, during the hard segments, accelerate the legs to the beat of the song (105 rpm). This should drive their power to above their FTP. If you don’t have power, use the cues “just below hard” and “where it starts to sting a little bit” for the two effort levels. Keep in mind that when you ease up, it’s not a recovery—it’s just a little bit easier. The first two surges are only 20 seconds long, but they are going to feel longer. The third one is more than twice that. They’ll have to push through till the legs hurt! Before the song started, I was already at about 90 rpm. As the song began, I added resistance to bring me up to the target power. 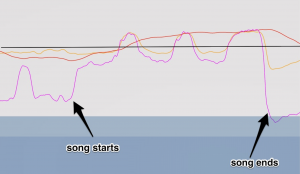 You can see I adjusted it a bit over those 45 seconds in order to settle in at just below “hard.” The goal is to not touch the resistance the entire song and only manipulate intensity through cadence, which you can see in the peaks of both the yellow (cadence) and the pink (power). I was alternating between approximately 170 watts and 210 watts. Your range may be more or less depending on where you are starting. Notice my heart rate kept rising, even though I backed off. That’s because it was still a challenge at 90 rpm! This is not the time to “recover”! By the end, I was breathing pretty hard. Note that heart rate continues to rise even for a short time after I dropped my power. This is typical of a high-intensity effort. Your riders will enjoy this, and the lyrics will help them realize they can get through the temporary “hurt” in the legs. 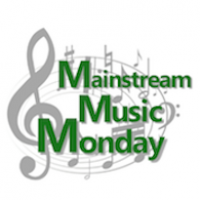 There are a lot of songs you can do very similar drills with during the chorus. These work especially well with songs in the 100–110 bpm range. Love the song! Thanks! Just a note: The timing for the last surge of the song is 2:35-end. You have a small typo. oops, fixed it! Thanks for the heads up! Using this! Thank you! Cute idea! This is one of those songs I just can’t retire! I do something similar, but have them take it up on ‘to the right’ and then we surge. It’s a blast when the class groans along ‘do it till your legs hurt!’ Great suggestion, as always!